Standard machine configuration listed below. Please contact your sales repre-sentative for other available configuration. Film threading: Pre-stretch design, W film threading pattern. Reinforcement structure in tower and turntable. 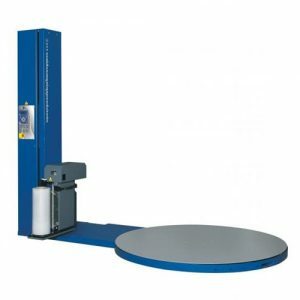 One of the lowest turntable elevation in the industry to ease operator loading/ unloading via pallet jack. Control Cabinet enclosed in column. Separate buttons controls of all parameters. Automatic Load Height photocell sensor is mounted in the stretch film carriage with adjustable track. Guaranteed For Life Pre-stretch rollers with 250% (100%-300%) pre-stretchratio as standard. 10mm thickness turntable plate is good to anti-deformation. Easy Film Loading carriage with lock door control for guaranteed locking. Powered Pre-Stretch Film Carriage Upgrade. 030 mm Film Adaptor on 0.025mm Carriage.